The last time that I saw the former Auschwitz-Birkenau camps, which are now called the Auschwitz Museum, was in 2005. At that time, I wanted to take a photo of the granite stairs in one of the brick buildings in the main Auschwitz camp. I stood at the bottom of the stairs, with my camera ready, waiting for the steady stream of tourists to stop for just one second so that I could get a photo of the stairs, which have been worn down by the feet of millions of visitors. Finally, I just gave up. This morning I saw the photo, that I had wanted to take, on this blog. The blog (named eyrealm) has lots of good photos, including photos of the suitcases and the shoes in one of the exhibit buildings in the main camp. When I was there in 2005, I waited for what seemed like an hour, so that I could get a photo of the artificial limbs. I had managed to take photos of the suitcases and the shoes in 1998 when there were very few tourists. The eyrealm blogger was with a tour group. The group leader must have held back the other tourists, so that her group could take photos. The photos on the eyrealm blog show the changes that have been made at the Auschwitz main camp in the last 7 years. The kitchen building just inside the Arbeit Macht Frei gate is now painted a muddy white color to show the way it looked in January 1945 when the camp was liberated. The photo of the band playing has been removed from the end of the building. I think the building looked much better when it was painted black. 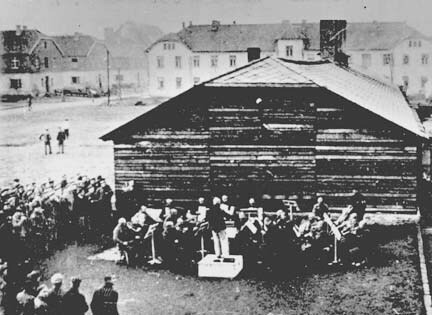 Every day the prisoners who hadn’t already been sent to the gas chambers lined up to go to work to the music of musicians who played march music in front of this building. 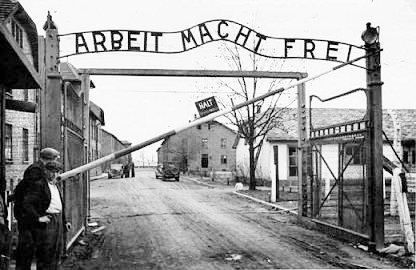 I noticed that the eyrealm blogger did not get a good photo of the Arbeit Macht Frei sign on the gate into the main camp. This is almost impossible to do, what with all the tour groups entering every 15 minutes with no pause in between. As we walked through the gates of Auschwitz words above the iron gate were (translated) Work Brings Freedom! What a cruel joke! The sign was not a cruel joke. The meaning of the sign is that “work liberates” in the spiritual sense. This sign was used only at Class I camps, where prisoners had a good chance of being released. I blogged about the Arbeit Macht Frei sign at Auschwitz, two years ago, here. 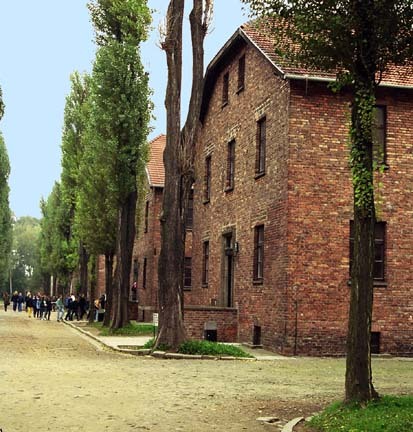 Regarding the brick buildings in the main Auschwitz camp, the eyrealm blogger wrote: “These brick buildings were already built for military housing which is why they decided to start here.” No, the buildings were built in 1916 to house migrant workers when Silesia, the area where the camp is located, was part of Germany. The recent photos on the eyrealm blog show that new trees have been planted in the main camp. When I was there, there were several dead trees, which have now been replaced. I learned that another thing that is new at Auschwitz-Birkenau are the grey sign boards with white letters, which tell the tourists the history of the camp. BEGINNING OF DEPORTATIONS OF POLES. 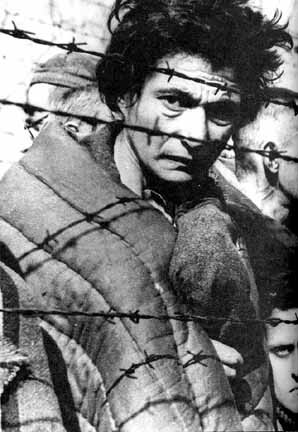 THE NAZIS SENT TO THE CAMP 140-150 THOUSAND POLISH PRISONERS HALF OF THEM PERISHED. BEGINNING OF DEPORTATIONS OF 25 THOUSAND PRISONERS OF VARIOUS NATIONALITIES. ABOUT HALF OF THEM PERISHED. BEGINNING OF DEPORTATIONS OF 15 THOUSAND SOVIET POWS. MOST OF THEM PERISHED. BEGINNING OF MASS DEPORTATIONS OF 1,1 MILLION EUROPEAN JEWS. AUSCHWITZ STARTED FULFILLING TWO FUNCTIONS: WHILE REMAINING A CONCENTRATION CAMP, IT BECAME A SITE OF THE HOLOCAUST, THE BIGGEST MASS MURDER IN THE HISTORY OF MANKIND, PERPETRATED BY THE NAZIS. ABOUT 1 MILLION DEPORTED JEWS WERE MURDERED BY THE SS MAINLY IN GAS CHAMBERS. BEGINNING OF DEPORTATIONS OF 23 THOUSAND ROMA (GYPSIES) 21 THOUSAND OF THEM PERISHED. This constitutes a big change in the Holocaust story. The number of Jews murdered at Auschwitz-Birkenau is down from 4 million to 1 million, who were mainly killed in gas chambers. So there were no typhus epidemics at Auschwitz? Next a commandant stood at the beginning of the line and pointed people either to the right or the left. Old people, pregnant women, babies, children too young to work and those who were sick or infirm were sent to the right with the flick of a hand. The healthy ones who looked as though they could work were sent to the left. Those to the right were sent directly to the gas chambers. The above quote shows that there has been a big change in the Auschwitz story. It used to be that doctors, including the famous Dr. Mengele, stood at the beginning of the line of prisoners and waved prisoners to the left for the gas chamber and the healthy prisoners to the right to work. When a prisoner died for whatever reason, his old clothes were issued to the next prisoner without ever seeing the laundry. Apparently, this tour group did not make it all the way to the Sauna building where the clothing was disinfected in steam chambers before being given to the prisoners. 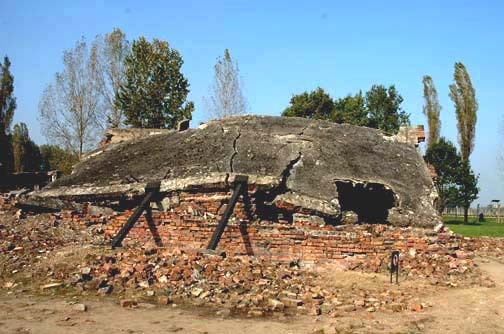 A recent photo, on the eyrealm blog, of the ruins of the Krema II gas chamber, shows that efforts to prop up the ruins have failed; the roof shown in my 2005 photo below has now collapsed. It was an unbelievable display of man’s inhumanity to man! What always amazes us is that so few Germans had enough of a conscience or a sense of right and wrong to bring themselves to report what was going on or try to help in some way. Just before the war ended, eighty thousand prisoners were rounded up for what is now known as the Death March. Most of them perished in the freezing cold of mid-winter, many without shoes. The story used to be that 60,000 prisoners were on the death march. 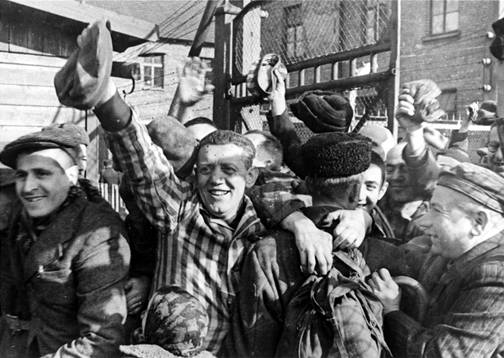 The prisoners were not “rounded up.” The prisoners in the camp were given a choice of whether they wanted to join the march or stay in the camp to wait for the Soviet soldiers. Only 7,000 prisoners chose to remain. Numerous survivors of the march have said that the Germans gave the prisoners a good pair of shoes from the clothing warehouses that were called “Canada.” Most of the prisoners on the Death March survived the 50 kilometer march to Gleiwitz where they were put on trains and sent to camps in Germany. On January 27th only about 7,000 emaciated prisoners with vacant eyes were liberated by the Russian army. The horror of Auschwitz haunted them for the rest of their lives. The photos from the re-enactment of the liberation, which were taken by the Soviets, show angry eyes or happy eyes, but not vacant eyes. Instead of emaciated prisoners, the photos show survivors with double chins. I agree with you: the ARBEIT MACHT FREI sign was a relic of Theodor Eickes’s times, when the system of camps had a reeducational aim and communists, work-shy and petty criminals were offered a chance to get back to society through a spiritual cleansing by work and often did. At first the prisoners would be sleeping on the floor with a little straw or straw mats full of insects.Then they were sent to barracks where they were stacked, five to eight people per “birth”! With such a superior intellect, is it any wonder these guys monopolize academia? Today’s students don’t learn how to spell. There is no need to learn spelling when you have a spell-checker. Unfortunately, a spell-checker won’t catch an error like using the word “birth” when you mean “berth.” Many of the Holocaust survivor books say that the prisoners slept three to a berth. They slept across the bed, not with their heads at the head of the bed, so that there was plenty of room for three people in one berth. This particular tour guide seems to have exaggerated at every turn. Forget what? The lies we are taught to believe or what REALLY happened in these camps?